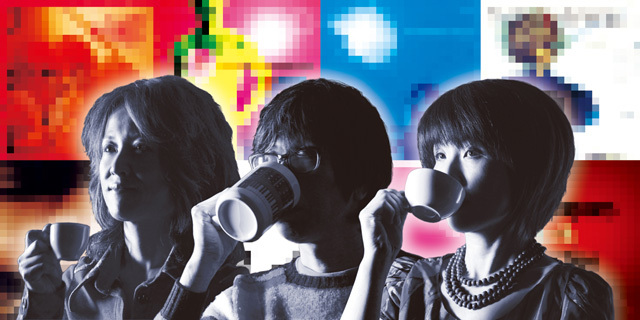 Buffalo Daughter is a three member group consisting of Sugar Yoshinaga, Yumiko Ohno and MoOoG Yamamoto, often augmented by a drummer and other guests. Their sound is heavily influenced by German progressive rock and techno pop, but also includes bits of dub, club, shoe gaze and post-rock influences. Given their mix and match style, and that they emerged in the mid-90s, they are often considered as part of the Shibuya-kei movement. Before putting together Buffalo Daughter, Yoshinaga and Ohno played together in a band called Havanna Exotica. Buffalo Daughter’s 1994 debut EP Shaggy Head Dressers was released on the Cardinal label, a spin-off of the popular indies magazine Beikoku Ongaku. When the American group Luscious Jackson were touring in Japan they met Buffalo Daughter, and favorably impressed with their music, passed samples along to the their label honchos at the Beastie Boys own Grand Royal Records. As a result Buffalo Daughter signed with Grand Royal in 1996, and released Captain Vapour Athletes internationally. The band spend a good deal of 1996 in the States, first playing a few East Coast dates in March, then doing an extended tour with Butter 08 in September, and returning again for dates in November with Luscious Jackson. Their impressive live shows had a great deal to do with breaking the band both in Japan and internationally. In 1997 Grand Royal followed with a remix EP, with Buffalo Daughters remixed by the likes of Alec Empire, Money Mark and U.N.K.L.E. Also in 1997 Buffalo Daughter played Grand Royal events in London and Paris with labelmates Ben Lee, BIS and Luscious Jackson. In 1998 the band returned with the new studio album “New Rock”, and toured the US and Europe with Money Mark. They also performed at the Tibetan Freedom Festival in Washington DC in June 1998 along with the Beastie Boys, Radiohead, REM, Sonic Youth and Herbie Hancock. They returned again to the States in July and August to tour with Boys Against Girls. In 2001 Grand Royal suddenly shut down, and the band moved to LA based Emperor Norton, where they released “I”. Also in 2001 Buffalo Daughter played Japan’s top electronic music event Electraglide, on a bill with Fatboy Slim, Aphex Twin and Plaid. In 2003 they released “Psychic” on V2 Records, and toured America with Blonde Redhead, and in 2006 released “Euphorica”. This versatile group has collaborated with a wide range of artists including the French ambient pop group Air, former member of techno-pop pioneers The Plastics, idol Ami Suzuki, veteran Mari Natsuki, Takako Minaka, Cornelius, Naoko Yamano of Shonen Knife and Cibo Matto. Sugar also sometimes plays in the side project band Metalchicks, and has toured the States and Europe with them. They have also had their music used in ads for Listerine, Minute Maid, Minolta, Panasonic and 7-11’s Slurpies amongst others. In 2007 they played the Formosa Festival, their first live show in Taiwan. In July 2010 Buffalo Daughter released “The Weapons of Math Destruction”, on their own Buffalo Ranch label, their first release in four years. They again collaborated with support drummer Atsushi Matsushita, who also plays with Zazen Boys, and with who played at Fuji Rock 2010 and did a national tour in November. This album not only includes their past songs but also a mix of some new recordings, covers, concert performances and remixed recordings. Recently at a Tokyo and Osaka gallery, an exhibit was created, which follows the band’s history. It was announced that the group will release their 7th album this summer.